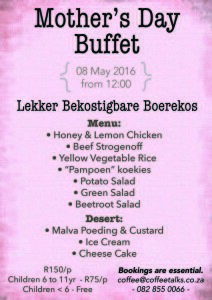 Lekker Bekostigbare Boerekos Menu: Honey and Lemon Chicken Beef Stroganoff Yellow Vegetable Rice "Pampoen" Koekies Potato Salad Green Salad Beetroot Salad Desert: Malva poeding & Custard Ice Cream Cheese Cake R150/p Children 6 to 11yr - R75/p Children < 6 - Free Please let us know if you are interested via Cell: 082 855 0066 Email: coffee@coffeetalks.co.za or send us a message on Facebook. Every Thursday Night from 6:00pm Food and Coffee available at Cafe. Soup and Bread will be on the coal stove in Winter times 😁 Bring your family or friends and have some good fun! 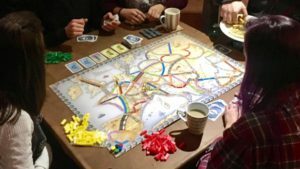 We’ve got a collection of over 50 quality boardgames to choose from! 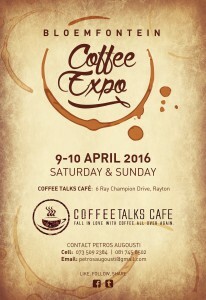 Only R10 entrance, then you have access to all the games! Really great fun, and the “kaggels” will be burning!